A funny thing happened on Day 1 of SharePoint Conference. Scott Guthrie did not announce the Microsoft Office Developer Tools for Visual Studio 2012 – Preview 2, despite the Apps for Office and SharePoint Blog post that went live just after the keynote. I could have missed it, but you’re free to stream the whole 2 hours for yourself and tell me the minute mark. Or, you can stream just the 23 minutes Scott Guthrie was talking. 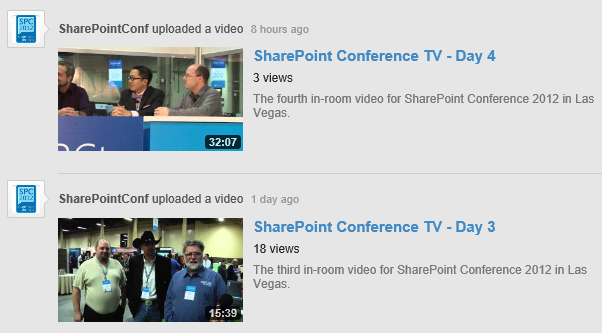 While we’re on the SharePoint Conference YouTube channel, you might notice they added a SharePoint TV video 8 hours ago, so there may still be content to come. At any rate, the tools were released, despite the fact that the announcement got cut from the keynote. Installation instructions below after some highlights. 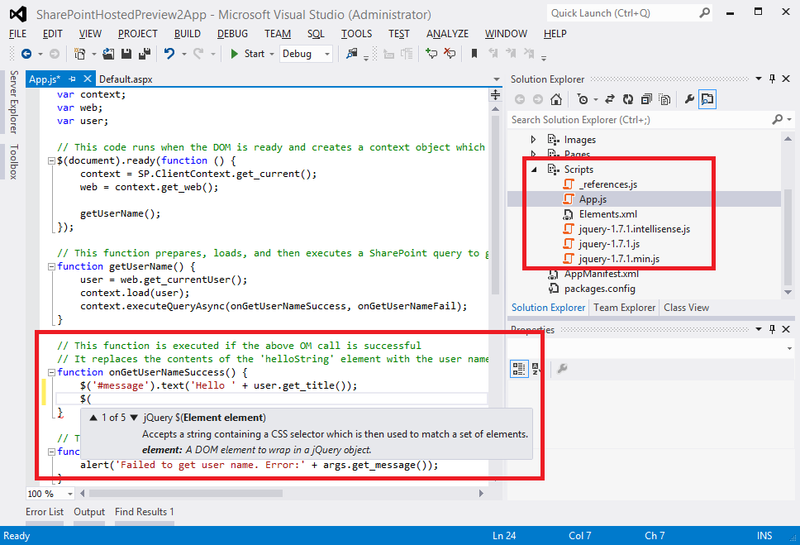 One of the things I noticed during the developer breakout sessions was a change in the script files I was seeing in Visual Studio 2012 demos. I noticed a jQuery script with Intellisense in the name. Turns out, the presenters from the SharePoint Product Team had Preview 2 (or newer) installed. Notice two things: first, the new files included when you create a new SharePoint Hosted App from the project template and second, when you type $( you see jQuery intellisense code completion suggestions. 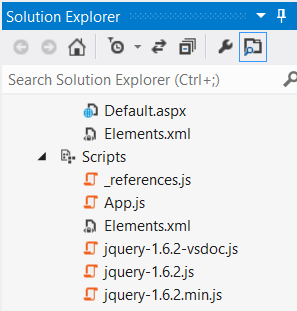 Compare the screenshot about created from the Preview 2 App Project Template to the clip of the scripts in the Solution Explorer below. Notice, that the version of the jQuery files was updated from jquert-1.6.2.js to 1.7.1 in Preview 2, as well. My favorite session of the conference was a breakout by fellow Texan and multiple time SharePoint MVP award winner, Eric Shupps. Eric got such a great response, he started a @SPYoda twitter account after the session to capture all his hilarious quotes from the session. One of the things Eric demoed was a horribly painful configuration process necessary for high trust apps in SharePoint 2013. Read his 30 page post, or at least the 1st paragraph, for a great explanation of high trust apps. Yesterday, Kirk Evans, who I believe still lives in Dallas, wrote this new post on the subject, Creating High Trust SharePoint Apps with Microsoft Office Developer Tools for Visual Studio 2012 – Preview 2. While I haven’t walked through either process myself, I take it that Preview 2 made things a little easier on us. If page length is any indication, the newer post is only 6 pages long. Does that mean deploying high trust apps got 5 times easier? I hope so. 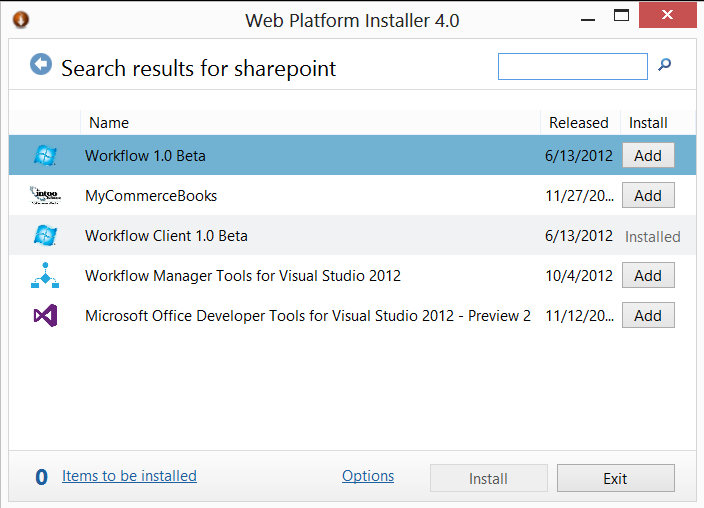 If you’d like to install, download Preview 2 of the SharePoint Developer Tools or launch the Web Platform Installer and search for SharePoint. This Friday, November 30th, I’m delivering a webinar on the App Model, free registration, as part of Rackspace SharePoint Services’ 2nd Free Week of SharePoint 2013 Webinars.